Public approval of reduced troop numbers in Iraq is linked to the country's short-term political stability, a new poll indicates. 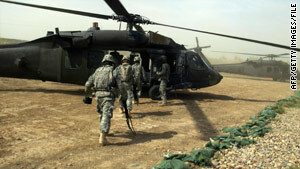 Washington (CNN) -- Support for President Obama's planned removal of U.S. troops from Iraq by the end of the August could drop significantly if Iraq cannot solve its current problems in time, according to a new national poll. A CNN/Opinion Research Corp. survey released Saturday indicates that 64 percent of Americans favor the president's plan to keep just 50,000 U.S. troops in Iraq by the end of the summer, with 35 percent opposed. But public approval of the plan falls to 51 percent if Iraq does not have a stable government by August and there is widespread violence at that time, with opposition rising to 48 percent. "Support drops more than 20 points among Americans with a college education and among suburbanites," said CNN Polling Director Keating Holland. "But among people who never attended college, opinion barely changes. The same is true for people who live in rural areas." The survey also indicates that the conflict in Iraq remains very unpopular, with more than 6 in 10 saying they oppose the war. Defense Secretary Robert Gates said that despite the recent spike in violence and political impasse, the planned withdrawal continues. While the pace of the withdrawal is being determined by the top commander in Iraq, Gen. Ray Odierno, the deadline, which was set in an agreement with the Iraqi government, remains on schedule. "We plan for everything. But right now, every expectation is that we will meet the 50,000 as of the first of September," said Secretary Robert Gates on May 20. With the reduction of troops, the U.S. now has more troops in Afghanistan than Iraq for the first time since 2003. According to the poll, the war in Afghanistan fares only a little better, with 56 percent now saying they oppose the war in Afghanistan, up from 49 percent in March. Support for the conflict in Afghanistan stands at 42 percent, down six points from March. "The war in Afghanistan remains popular among Republicans, with about two-thirds of them saying they favor the war," adds Holland. "But support among Democrats is only at 27 percent, and among Independents it has fallen 10 points, to just 40 percent. That is the lowest support for the war among Democrats and Independents that we have seen this year." The CNN/Opinion Research Corp. poll was conducted May 21-23, with 1,023 adult Americans questioned by telephone. The survey's overall sampling error is plus or minus three percentage points. CNN's Adam Levine and Paul Steinhauser contributed to this report.